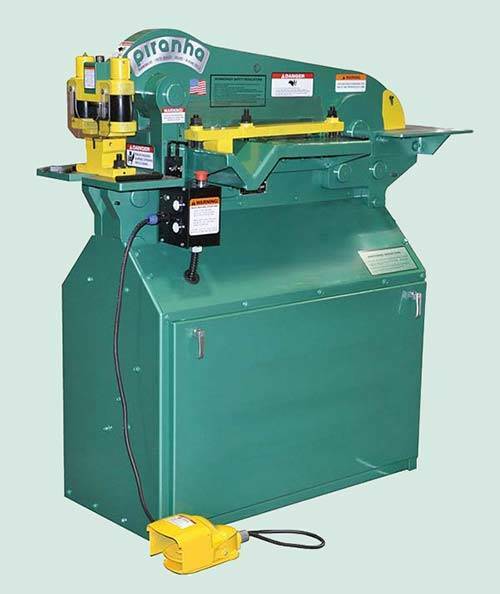 Piranha P-50 ironworker machines are the entry-level of the iconic line of Piranha hydraulic ironworker machines, but they don’t lack the toughness and precision that is expected from a Piranha Ironworker. They are just the right tool for many jobs, but if you need more, check out our full line of ironworker machines. P-50 is the entry point in our line of hydraulic ironworker machines which includes P-50, P-65, P-90, P-110, and P-140 single-operator ironworkers, and PII-88 and PII-140 dual-operator ironworker machines. Industry leading cycle times—punch holes in less time than other ironworkers. Urethane Strippers—Results in less part distortion, faster cycle times, no need for stripper height adjustment. Integrated notching station—Low shear removes fillet for precise, burr-free cuts and clean notches. Ergonomics—Convenient work height and visibility for all stations. The single work height also provides added benefits when using roller feed tables. Plate Shear 13″ Long 3/4″ x 6″ 1/2″ x 10″ 3/8″ x 12″ 1/4″ x 13″ Motor Std. 230/460 3 Ph. 1800 RPM Opt Phase & Voltage Available 3 HP 3 Ph.